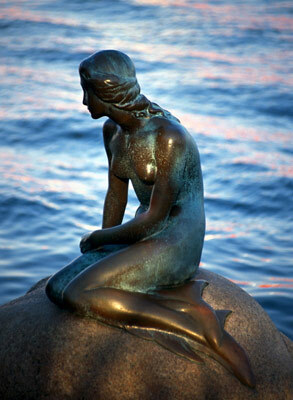 A statue of Hans Christian Andersen's Little Mermaid (below) has long been one of the biggest tourist attractions in Copenhagen, Denmark. But for the next six months, she'll be visiting China, and her rock will be empty for the first time in almost a century. So on April Fool's Day, some crafty pranksters decided to fill the void. 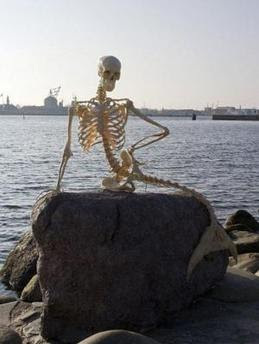 Tourists who came looking for the Little Mermaid instead found her skeleton. I wish I could have seen their faces. For a second i thought the skeleton was the statue. That's absolutely fantastic. Good on them! Ha! I wish I could do things like that. (But I need the resources and the opportunity...) It would have been nice to see. I wonder where they found that skeleton..... very cleaver!! Beautiful! I too wish I could have seen their faces. Happy Easter! Nellie, virtual high-five! It came from the DEEP!!! LOVE IT! I wonder where they found the tail!? Do you know if the skeleton is made of real bone? I want to meet those pranksters. Once I brought that book to class in kindergarten to the "joy" of my teachers. My little Christian school sent frantic calls to my mother when I got to the part with the sea witch's lair filled with mermaid corpses. Cool! i wonder how much it cost to make. Ananka, do you know when the t-shirts will be up in the store? Pingoo--I thought the same thing! Thats really cool! Thats so clever! The real story of the little mermaid is so sad though. I read it and the rest of the day was depressing. But I love fairy tales. i like it- i read a bok on that statue once- a happy hollister one- young but good. i collect them. i have 1 worth over a $100. I'M ON SPRING BREAK!!!!!!!!!!!!! YAY!!!!!!!!! I am a big Tim Burton fan also! I went in November, and could hardly breathe. If you have heard (I say it all the time), I grew up far away from Dr. Suess. I let Burton and Gorey guide me through my childhood. Tim Burton is my hero! (And so are Kirsten Miller, The Irregulars, Pseudonymous Bosch, Erik, Gerard Butler, Andrew Lloyd Webber, Beatrix Potter, Jesus,Scott Westerfeld, Tyra Banks, and Edgar Allen Poe.) Yes, those are a lot of heroes, but they are also my role models! You will laugh until you die. Except not really, because you pass out first. Tim Burton is so genius! One of my favorite movies as a kid was Ngihtmare Before Christmas, we would watch it every Halloween. Coraline was great, so was 9, and Alice in Wonderland was awesome! Has anyone else seen it? Anna- You just basically described my hero's except Tyra Banks which I would replace with, Joan of Arc, and Artemis. we made the funniest video for an award ceremony at school. it was a parody of the A-team. we called the ESR Team. Any1 have an earth science ref. table? it a NY thing I think. I happen to think it's wrong the way Disney altered the original story of The Little Mermaid.What would dear old Hans think of what they did to his story? Anyone with me? Kirsten, I've noticed you have been taking a while between posts. I hope that that's just because The Darkness Dwellers is going to be published sooner than expected. AND I AM 12 IN 8 DAYS!!!!!!!!!!!!!!!! when are you going to post again . . . . . i have nothing to do and i need something interesting to read. Emily: Yes, I'm with you. It always annoys me when movie people do stuff like that. "Prince Caspian" was the worst. People, leave Ananka alone! She has an actual job and is undoubtedly very busy in real life. "Prince Caspian" was the best! I love that movie . . . I emailed the link to all my friends. Actually I think there has been other pranks like that on the little mermaid! PS. I LOVE ANANKA'S DIARY! There's a Lesson Here Somewhere . . . Happy April Fools Day, Everyone!